Last night I walked in the door at 5:30pm (totally unprecedented) and walked straight up the stairs and put a sweatshirt and pajama bottoms on. I went back downstairs, ate a salad, and told my husband that only fire would make me go back out that door before tomorrow morning. I sat in a chair and knit until 10:00pm on Trellis and Vine. I believe it was the first time I relaxed in about 10 days (or more). If ever there was an evening I should have had a glass of wine (and didn't) that was it. I feel much better for it today. Life isn't supposed to lived at 100000 MPH. This is a better photo of the hunting sock I knit at the golf tournament. Not bad for one day's work. The yarn is Summit Hill from Kraemer yarns. 100% wool superwash worsted. It's nice. Just another UFO for the basket. I keep starting them. Finishing them is always the problem. So the new Knitty is up for Fall. (www.knitty.com) I have to say it's not bad at all. I liked a lot of those patterns. I loved the cover sweater (Viveka) until I took a good look at the sleeves. What's that all about? I'd knit it, but I'd modify those sleeves. That would just drive me (and most people) crazy. The pattern I was most impressed with was Avast. I think that has to be the most professionally and well designed piece I have ever seen on one of these amateur designer sites. I would make that for my son tomorrow if I thought he wouldn't lose it. He loses everything. I just couldn't take the chance. It's an awesome sweater. That designer, Jesse Loesberg, also designed the Danica Scarf (entrelac) that I loved in one of the previous issues of Knitty. All of the sock patterns are nice but I'm not a fancy sock knitter. 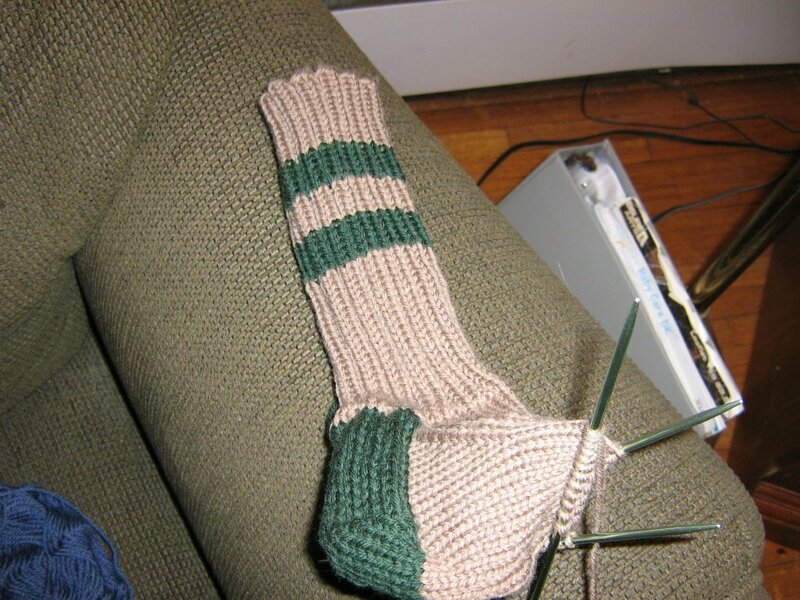 I like sock knitting to be completely mindless. I like the yarn to do the talking with hand knit socks. Ok, I better get back to the grind. Have a great day. i like the sleeves on the sweater and have actually been looking for a pattern like that for awhile.